Family Owned & Operated Since 1898. Celebrating the life of Raymond J. Wojna, Sr.
Be the first to share your favorite memory, photo or story of Raymond. This memorial page is dedicated for family, friends and future generations to celebrate the life of their loved one. 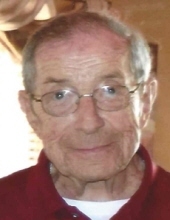 Obituary for Raymond J. Wojna, Sr.
Raymond J. Wojna, Sr., age 91 of Bridgeport, husband of Helen (Nemergut), passed away on January 17, 2019 at St. Vincent’s Medical Center. Born in Bridgeport on January 23, 1927, he was the son of the late Albin and Valeria Wojna. Raymond was a graduate of Warren Harding High School and honorably served in the US Army during WWII. After discharge he was employed by Singer Sewing Company before working at General Electric as a machinist until his retirement in 1992. Raymond then worked at Fairchild Wheeler Golf Course as a golf cart attendant. He enjoyed playing golf with his sons and friends and was also a talented duckpin bowler. Raymond was a member of the Polish Falcons, an usher at St. Michael’s Church in Bridgeport and for many years coached Park City Little League. Raymond was affectionately known as “POP” to all. To his family, he was a reliable “Mr. Fix-it”. Raymond is survived by his beloved wife of 66 years, Helen; his devoted sons Raymond and wife Jan, David and wife Paula; loving grandson David and wife Britnee; brother, Edward and wife Elsie; and several nieces and nephews. He was predeceased by his brothers, Chester and Bernard and sisters Ann, Alberta, Dorothy, and Regina. Friends are invited to attend the funeral on January 23, 2019 at 9:30 am at the Pistey Funeral Home, 2155 Main Street, Stratford and at 10:30 am at St. Andrew Church, 395 Anton Street, Bridgeport. Interment will follow at St. Michael Cemetery, Stratford. Friends may call on Tuesday, January 22, 2019 from 4-8 pm at the Pistey Funeral Home. In lieu of flowers, memorial donations may be made to The First Tee at Fairchild Wheeler Golf Course, 2390 Easton Turnpike, Fairfield, CT 06825 or St. Jude Children Research Hospital, 262 Danny Thomas Place, Memphis, TN 38105. Please visit www.pisteyfuneralhome.com to express condolences online. To send flowers or a remembrance gift to the family of Raymond J. Wojna, Sr., please visit our Tribute Store. "Email Address" would like to share the life celebration of Raymond J. Wojna, Sr.. Click on the "link" to go to share a favorite memory or leave a condolence message for the family.